Durable, efficient, simple – Lithium-ion batteries are superior to conventional batteries and are extraordinarily versatile in their deployment. YES, IT’S ALL IN THE MIX: SSL-Energie GmbH uses Lithium iron phosphate in its cell production. Our plasma treatment procedure challenges the potential of this technology to the limit. This ensures an above-average cycle stability and a longer service life – often proven to exceed ten years; an excellent temperature stability and unusually high charging- and discharging currents. We use no reactive oxygen materials with the effect that our batteries are protected from over-heating. The gas-tight aluminium housing prevents leakage of electrolyte and prevents the penetration of moisture. This protects the cells and is effective in the mitigation of detrimental effects to general health. The robust, cylindrical cells are currently available with a rated capacity of between 8 Ah and 48 Ah. The consumer should always exercise caution when selecting a battery system. A safe bet is to go SSL Energie GmbH. Already noteworthy is the number of protective mechanisms in place at cell-level. Thanks to the deployment of non-oxygen-reactive materials, the cells are protected against overheating (thermal runaway); namely, the electro-chemical reaction is interrupted in the event of over-pressure or temperature. The cylindrical form of the cells ensures high mechanical resilience. The cells are also designed to offset any excess, internal pressure-increase. Such an occurrence is, however, extremely unlikely. The likelihood is rendered even less, through the intelligent battery-management systems designed by our partner. These monitor each individual cell, deactivate the corresponding higher-level module in the event of error and have the ability to react to short-circuit faults or overcurrent within less than 20 milliseconds. Safe is safe. Safety means SSL Energie GmbH. In order to guarantee the environmentally friendliness of our batteries end-to-end, we would ask you to please return all used products to us, or to one of our partners. 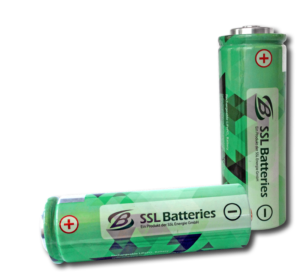 According to §18 of the battery provision (BattG), all end users are required by law to return the products. The disposal of these products as household waste is not permitted.